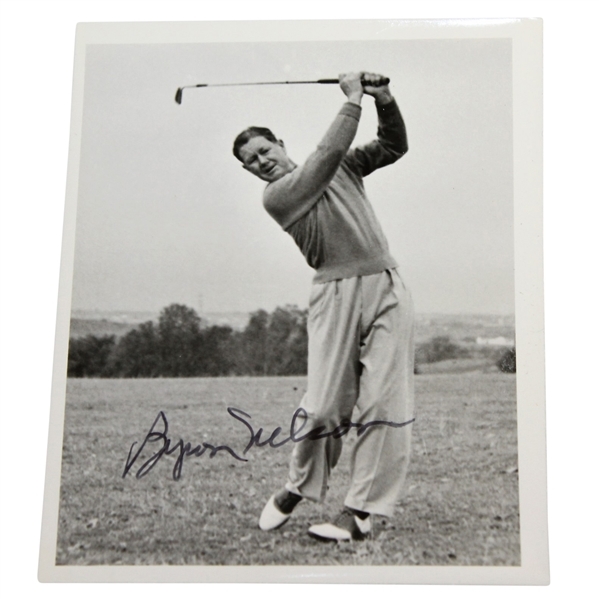 Presented here is a black and white 4" x 6" photograph of Byron Nelson post swing with an iron in his hands. Nelson signed the photo nicely in black ink. While Nelson cut his own career short, by retiring at age 34, he didn't fail to leave his mark on the game. Nelson won the Masters tournaments in 1937 and 1942. In 1945, Nelson won 11 consecutive tournaments and 18 out of the 35 possible tournaments in a shortened season due to the war. His name is now attached to the AT&T Byron Nelson Championship, the first PGA Tour event to be named after a professional golfer.